Tuscan red and traffic yellow, pink blush and lawn green, mahogany pearl and bistro orange, plus more than six kinds of blue (to name a few). 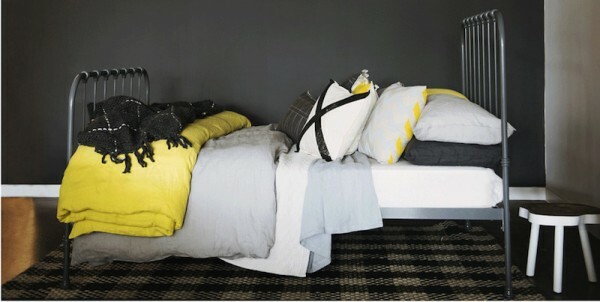 With so many colour options, the Tilly bed from Scout House sure can sing a rainbow. When my son and I first saw pictures of the Tilly bed, we both wore matching smiles. He was excited because it was colourful and looked like fun, and I was excited because it combines two things I love: good design and sleep. A wrought iron bed by Melbourne-based Scout House, each Tilly is custom-made to order. Hand crafted in Australia, the beds are made from steel frames and high quality timber slats. This quality, and the simple, elegant design, make Tilly a bed that’s at home in any home. Like the Scout bed before it, Tilly is available in 120 different colours (I may or may not have counted the colour chart to confirm). Frames are coated to order, so you can choose the colour or shade that will best match your child’s space. Beds come in all Australian sizes, so you can order a king bed for yourself while you’re ordering the single for your child. There are a lot of great beds out there, but there’s something really special about having something that was made just for you. Plus, the colour charts are a good way of expanding your child’s colour knowledge beyond the rainbow. Or your own. Tilly is available to order through Scout House.